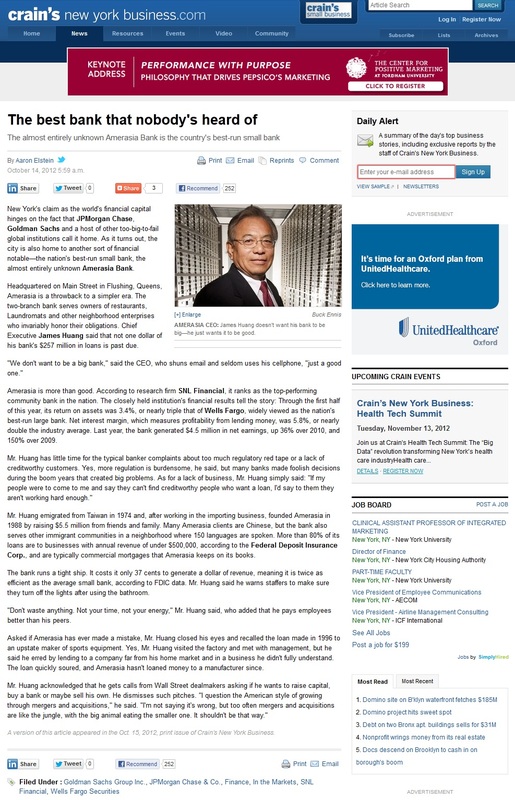 "America's best bank - Amerasia envy"
"New York is home to at least one successful bank. It is in Queens." "The best bank that nobody's heard of"
"The almost entirely unknown Amerasia Bank is the country's best-run small bank"
"AMERASIA Die beste Bank Amerikas"
Ranked #1 by SNL for Best Performing Community Bank under $500M in asset among 4,300 banks in the US for 2011. Ranked #8 SNL for Best Performing Community Bank under $500M in assets among 4,832 banks in the US for 2010. Source: SNL Financial LC. Contains copyrighted material distributed under licensed from SNL. For purely informational purposes only. See SNL Financial LC for more information. Ranked #1 by FMC for Best Overall Performance among 125 banks in New York for 2011. Amerasia Bank is ranked number one in the state of New York for its overall performance by FMC Group. This ranking is based on return on assets, return on equity, efficiency and other various categories. Ranked #1 by FMC for Best Overall Performance among 129 banks in New York for 2010. Amerasia Bank is awarded a 5-Star (“Superior”) Rating from BauerFinancial, Inc., an independent bank rating company. Bauer’s 5-Star Rating, their highest performance ranking, represents an independent, unbiased analysis of a financial institution’s safety and soundness position. Bauer has been analyzing and reporting on the financial condition of the nation’s banking industry since 1983.